What links two turn of the century artists, steeped in the imperialism of their day, with a contemporary artist exploring notions of identity and veracity? This is the question which Tim Barringer, Paul Mellon professor of Art History at Yale University, sought to answer in his talk on Monday 22nd November 2010 at the Cochrane Theatre. In conjunction with the exhibition ‘Before and After Modernism: Byam Shaw, Rex Vicat Cole, Yinka Shonibare MBE’, held in the Lethaby Gallery, CSM and Byam Shaw hosted a conversation between Barringer and Byam Shavian Yinka Shonibare MBE. In his introduction, Barringer talked about the lives and works of the school’s founders, John Byam Liston Shaw and Rex Vicat Cole. Referring to pieces both in the exhibition and elsewhere, he contextualised the work of these two men who, by embracing 19th century traditions of British art and society, found themselves lost amidst the new wave of Modernist art which first hit London in the ‘art-quake’ of 1910 (the year of the school’s founding). Despite this displacement by a new aesthetic which ran so contrary to their own ideas of beauty (see Shaw’s cartoon The New Art – Alas! Poor Beauty, 1912), Shaw and Cole’s vision of pedagogy, and their enlightened attitude to teaching both men and women at their new school, proved strong enough to withstand the turbulence of the contemporary art scene. It seems perhaps unlikely that there would be any likns between these two artists and Yinka Shonibare MBE, but Barringer drew on his considerable knowledge of the works of all three, as well as of the history of twentieth century art, to draw some interesting parallels. Perhaps the clearest of these is the aesthetic which is present in so much of Shonibare’s work, especiallyDiary of a Victorian Dandy (1998), a ravishing faux-historical tableau which could almost be mistaken for a still from one of the more overblown BBC costume dramas: Shonibare adopts the style and setting of turn of the century society, and manages with wit and lightness of touch to both celebrate and critique it. This readiness to engage with the politics of empire and colonialism can also be seen in his decision not only to accept an MBE, but to incorporate the title into his name by deed poll. When questioned by Barringer, Shonibare was quite ready to admit to having revelled in the sumptuous scenes he created for Victorian Dandy, and said of its implied criticism of Victorian mores, that he likes to ‘provoke’ viewers of his art, to make them consider their own values and ideas. This provocation is certainly evident in the new work presented in the Lethaby Gallery. Egg Fight (2010) was commissioned by Dublin City Gallery, and takes as its inspiration a passage from Gulliver’s Travels which details the battle between those Liliputians who eat their eggs pointy end up, and the ‘bigendians’ who oppose them, and are persecuted as a result. 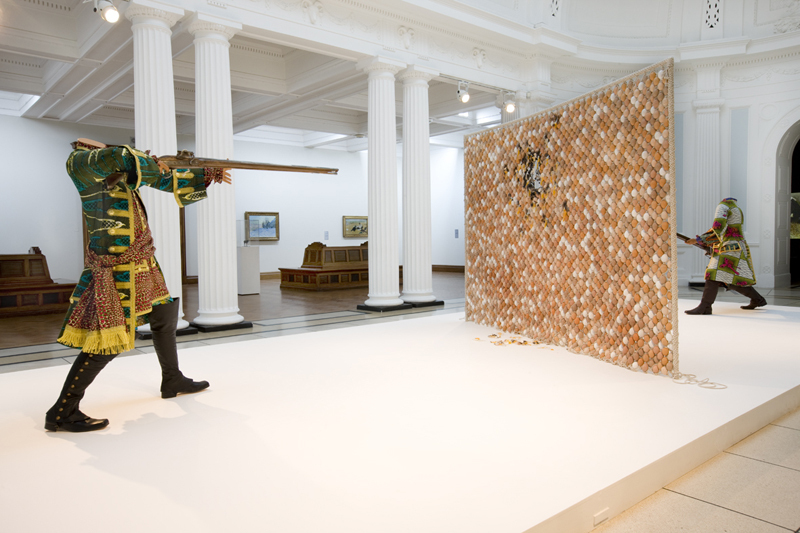 Although the piece is imbued with Shonibare’s characteristic wit, it clearly addresses the issue of conflict with its depiction of two well-dressed (if headless) gentlemen firing blunderbuses at each other, through a wall of shattering eggs. To make such a piece in response to a commission from a gallery in Dublin, capital city of a country which has seen more than its fair share of belief-driven conflict, is a bold choice. In conclusion, this interview was an interesting consideration of the question of recurrence in art, the appropriation and adaptation of cultural memes, and of how two painters – one almost pre-Raphaelite in his celebration of beauty and colour, and one a staunch chronicler of the English countryside – can be reconsidered in the context of post-modernism, now that the ravages of Modernism are past.